The time has come to wave another child off into the big wide world. Why do they have to grow up so quick??!! where as Freya is more reserved, she seems to stand back and assess everything and wait for people to come to her. It's amazing how different our children can be even when they are brought up the same!!! 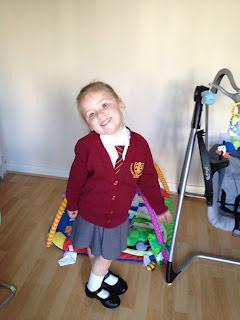 Well I needn't of worried, she was so excited last night, wanted to put her uniform on before eating her breakfast this morning and when we got to the school she couldn't wait to get rid of me. The teacher said to all of the parents that we could stay for a little while to get them settled in but Freya said "I think you can go now mum". And just for memories sake, here is her big sister Elise on her first day of school 2 years ago, how time flies.